The nutritional power of pomegranates is often overlooked. Eaten daily, a pomegranate provides 40 percent of the recommended daily requirement of vitamin C for adults. It also contains Vitamin B, folic acid, fibre, magnesium, potassium, niacin and vitamins A and E. and has been shown to contain three times the antioxidant properties of red wine or green tea. Antioxidants are important in protecting your body against the unstable molecules that can cause premature ageing and contribute to many other health problems. In ancient times, the Babylonians would chew the seeds before battle, believing it would make them invincible. In modern times, the pomegranate is a popular addition to Middle Eastern, Indian and Iranian cuisines. It is now slowly finding its way into Western cuisine, and is becoming known for its health benefits. Organic pomegranate juice has been available in many countries for the past few years. What are the health benefits of pomegranates? It has been estimated that pomegranate juice may contain close to three times the amount of antioxidants as green tea or red wine. Antioxidants help in the fight against free radicals, the unstable molecules that can damage DNA and cell membranes. This cellular damage has been linked to many diseases, including cancer. This beautifully coloured seeds of this fruit have been shown to reduce or completely eliminate intestinal parasites such as worms and candida. It is an excellent blood and kidney cleanser and is used as a remedy for bladder disturbances. Dr. Michael Aviram, a researcher at the Bruce Rappaport Faculty of Medicine the Technion-Israel Institute of Technology in Haifa, Israel, has conducted almost a decade’s worth of research on the pomegranate and its role in protecting the heart. 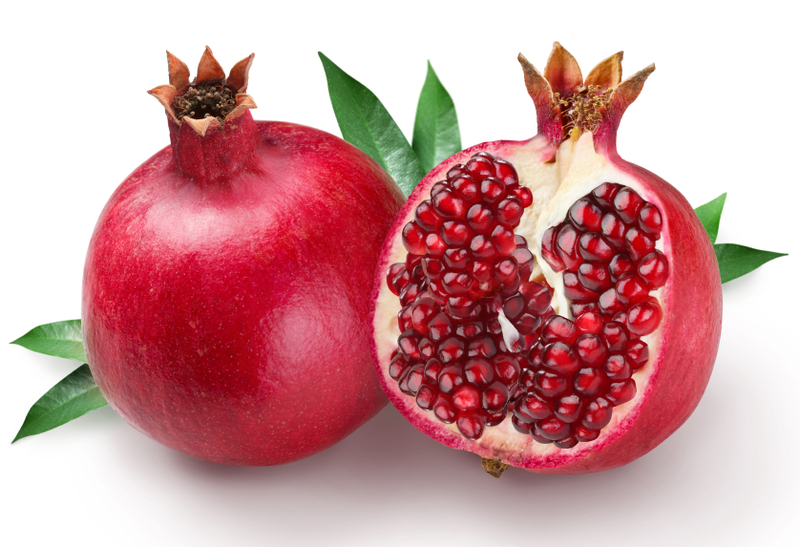 In one of Dr. Aviram’s studies, volunteers who drank 3 ounces (85mls) of pomegranate juice daily for two weeks exhibited a dramatic reduction in oxidized cholesterol. Dr Aviram further found that pomegranate reduced blood stickiness or the tendency to clump with age. A group of high blood pressure patients was given 50 ml (1.5 oz) of pomegranate juice daily for 2 weeks Test subjects registered: – 36% reduction in serum angiotensin converting enzyme (ACE) activity – 5% drop in systolic blood pressure. Researchers report that pomegrante juice is rich in antioxidants that can keep bad LDL cholesterol from oxidising (American Journal of Clinical Nutrition, May 2000). More recent research has found that eight ounces (236.5mls) of pomegranate juice daily for three months improved the amount of oxygen getting to the heart muscle of patients with coronary heart disease (American Journal of the College of Cardiology, Sept. 2005). Pomegranate extract may be useful in fighting osteoarthritis, according to a study at Case Western Reserve University, published in The Journal of Nutrition. In lab tests, the extract cut levels of an inflammatory chemical called interleukin-1b (IL-1b) and stopped enzymes that erode cartilage. Researchers said their findings “indicate the pomegranate fruit extract or compounds derived from it may inhibit cartilage degradation in osteoarthritis and may also be a useful nutritive supplement for maintaining joint integrity and function.” (Journal of Nutrition, Sept. 2005). Antioxidants in pomegranates have been found to reduce the oxidation of LDL (bad) cholesterol in mice, according to a study in the American Journal of Clinical Nutrition. It is though that pomegranate juice could block or slow the buildup of cholesterol in the arteries. Cholesterol buildup causes arteries to harden and narrow, which in turn can lead to heart disease. A study published in Proceedings of the National Academy of Sciences found that pomegranate juice combats hardening of the arteries and related diseases like heart attacks and strokes. It seems to limit the genetic tendency toward hardening of the arteries. “The protective effects of pomegranate juice were higher than previously assumed,” said Claudio Napoli, the study’s author and a professor of medicine and clinical pathology at the University of Naples, Italy. Another study published in the September 16 issue of the Journal of Cardiology found that after patients with coronary heart disease (CHD) drank pomegranate juice every day for three months: Blood flow to the heart improved by about 17 percent in the pomegranate group. Blood flow declined by 18 percent in the placebo group. “In conclusion, daily consumption of pomegranate juice may improve stress-induced myocardial ischemia in patients who have CHD,” researchers said. The seeds are the only edible part of the pomegranate. Slice off the top end of the pomegranate. Score the rind in several places around the fruit (from top to bottom). Break (or cut) the sections apart. Put the sections in a bowl of water. Pry the seeds out with your fingers (please be careful as the juice will stain clothes permanently). Strain the seeds using a colander. The seeds can be eaten alone, juiced, stored in the refrigerator or you may freeze them for later use. If you choose to drink pomegranate juice, first check the label to make sure you are only drinking the pure juice without any artificial colourings, additives such as sugar, or a mixture of juices that contain added sugar. The sugar adds more calories to the juice which reduces its general health benefits.